Situated very near to the Seminyaks sweeping beach is the Villa De La Vie which is a four-bedroom villa and has been designed for guests who wish to experience luxurious, stylish and the comfort of a private accommodation. The contemporary interior design and architecture of this villa radiates style. The decor of this villa includes a combination of blacks, whites along with splashes of red with the walls that have been designed in a combination of stone, wood and glass. Featuring high ceilings, the apartment features stunning landscaped gardens, swimming pool, custom designed furnishings, water features and much more. Villa De La Vie is huge, distinctive and undeniably chic and would prove to be an ideal choice for spending a relaxed vacation. An amazing spot! The staff were incredible. We stayed for 5 nights (large group of females) and had such a awesome time. The villa is close to everything but so secluded. Clean and modern layout - lots of outdoor space and a beautiful garden. Did I mention that the staff are amazing? 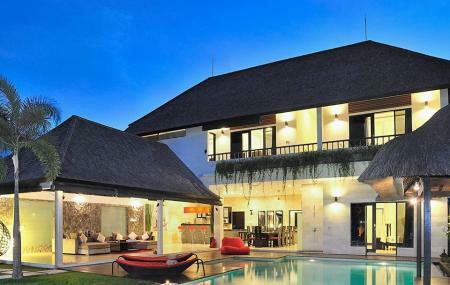 Location: spectacular and minutes walking away from anything and everything you will want on the Seminyak strip. Yet still quietly tucked away and private Facilities: the pool was spectaculars and five bedrooms each with their own full bathrooms was perfect. Sitting area overlooking the pool was so relaxing and the open air concept just worked! Staff: top notch and very accommodating these people are what made it all that much more special. Anything you wanted they tried to accommodate. Technology, speakers setup through the main floor for music while you enjoy and there are TV’s in every room. Wi-Fi was strong but the internet speed is slow as it is everywhere in bali it seems Cleanliness: the place was cleaned everyday and the pool twice during our 1 week stay! It was always spotless. Why should you stay here? : if you are looking to be minutes away from amazing restaurants, clubs (la Favela is 10 min walk) and are not picky about top of the line stuff (the tv and speakers are a little old) and want a space that you can truly enjoy then this is the spot. Incredible value for what you pay for!!! Great villa and superb location. Unfortunately, some of the TV channels were unwatchable (so couldn't watch AFL finals) and internet speed is below average. For the 5 star review, the above needs to be fixed.